Prime Cut Productions delivers a consistent Programme of Community Engagement throughout the year. Tailored Outreach Programmes are developed and delivered in conjunction with our Productions. We also run one special large-scale Community Engagement Production each year - working with a wide range community groups from across Belfast and Northern Ireland. At Arm’s Length is Prime Cut’s primary schools’ polyvocal diversity project, which sees children aged 3- 7 take part in fun creative workshops exploring difference and working towards the creation of a play that is performed in their school. 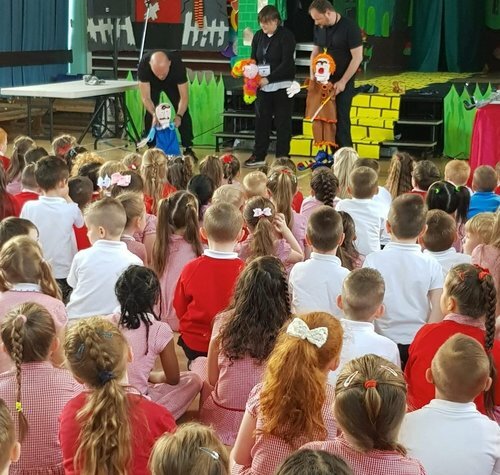 Since 2017, 12 schools and 300+ children across Belfast and Lisburn-Castlereagh have taken part in drama, storytelling and puppetry workshops, collaboratively creating a performance that has been seen by over a thousand children so far. At Arms Length is funded by Creative Europe as part of the EU Collective Plays Project, Belfast City Council and was seed funded and developed in collaboration with Lisburn and Castlereagh Council. Pulse was culmination of Prime Cut’s Ensemble NI project, which saw youth and adult participants from across NI sharing stories of life within their communities. A common thread of this work was the struggle to find normality in a place still marred by the legacy of conflict, the divisions within our society and the difficulty of finding help in times of crisis. Pulse gave a glimpse into these stories through a multi disciplinary theatre event. PROCESSIONS was a mass participation artwork marking the centenary of the Representation of the People Act, which gave the first British women the right to vote. Prime Cut Productions was one of 100 organisations, including 14 from Northern Ireland, who were commissioned by Artichoke to work with women artists up and down the country in the lead-up to the event, as part of an extensive public programme of creative workshops to create 100 centenary banners which will form part of this vast artwork. PROCESSIONS was commissioned by 14-18 NOW and produced by Artichoke. With support from the National Lottery through Arts Council England and the Heritage Lottery Fund, and from the Department for Digital, Culture, Media and Sport. Ensemble is at the heart of Prime Cuts Community Engagement work. We have delivered the Ensemble Projects across Northern Ireland since 2014, working with a range of community and voluntary organisations, exploring their views and opinions of their own communities, and Northern Ireland as a whole. Participation in Ensemble is free and is open on a year-round rolling basis. For further information contact Ciaran on 028 9024 4004. From 2015 to 2017 Prime Cut, in collaboration with Creative Exchange and Oh Yeah Music delivered the Re:Vision Projects as part of the Arts and Older People Programme. Re:Vision and Re-Vision II utilised multidisciplinary arts to engage with and improve the quality of life of older people in residential accommodation across Belfast. They culminated in an installation developed over 6 months working with people with Dementia, their friends, families and carers and a short film of their experiences. These were showcased at the Arts and Older People Showcase at Beanbag Cinema and at the Lyric Theatre as part of 2016’s Bounce Festival Our community partners on the project have been Bruce House, Hemsworth Court, Mullan Mews Glenalina Lodge and Sydenham Court. The Revision Projects were supported by the Arts council of Northern Ireland, Arts and Older People programme. Created as part of Prime Cut’s PARTICIPATE programme “The Place Between” looks at Mental Health and Suicide through the eyes of our young people. We hear of the services and support in place, and a war that rages to make sense of the World. The "Choices" project worked alongside Greater Shankill Alternatives, looking at the influences experienced by young people, and decisions that they make based on this. The short film, shot and edited by Bluebird Media, was premiered at Greater Shankill Alternatives AGM and the Community Relations and Cultural Awareness week 2016, and is now a resource used to explore issues facing young people, and the impact that their decision making can have on them. Working with groups across North Belfast, Prime Cut Productions used Drama, Music and Visual Art as a means of exploring the hopes and aspirations of Communities around Girdwood, a previous Army Barracks. This contested space located between 4 different communities provided the opportunity for a shared space, bringing people together from different cultures and traditions. Prime Cut and Bluebird media created a short film, working with students from Lagan College after running workshops with them, exploring the issues around Hate Crime. The students discussed different types of hate crime, as well as any experiences that they had witnessed in their own lives, and from this created a short script, which was then filmed over a couple of days in Castlereagh. Following the production of the DVD, Castlereagh Borough Council and the Police and Community Safety Partnership have used this resource while working with community groups and schools, addressing this issue. The Secret City is a culmination of The Stories of Us, a 9 month multi-arts collaboration with over 200 young people from across Belfast, and is part of the Cathdral Quarter Arts Festival 2015. Staged on the streets of Belfast, Kaleidoscope will allow you to encounter the city like never before. Choose where you go and what you look at as multiple stories weave around you, plunging you into the hopes, fears and daily lives of people from across the city. A new theatre production, which will give audiences a chance encounter with life in and around the Victorian Templemore Baths in east Belfast, will open to the public for a limited number of exclusive performances on Monday 7th May. The Baths is a community-led production involving people from the local area and is being created by leading Belfast theatre company Prime Cut Productions. The Demeter Project - Still Life Still was a performance that was the culmination of a year long project designed and managed by Prime Cut Productions with our Partners from Ardmonagh Family Centre, Ardoyne Women's Group, Dee Street Community Centre and Newhill Community Centre. Bringing together women from the North, East and West of the City aged between 14 and 17 and over 55 this project examines the contribution of women over the past century to the life of Belfast. As well as performances , funding from the Heritage Lottery Fund has enabled us to give the project a legacy, creating an online archive as well as a physical archive at the Linenhall Library, in Belfast. This has enabled us to preserve the all too often unheard stories of how Women have contributed to building the incredible city of Belfast that we live in today.